Model FG1, basic safety glasses. Can be used over eyeglasses. Model FG2, a bit more stylish. Can be used over eyeglasses. 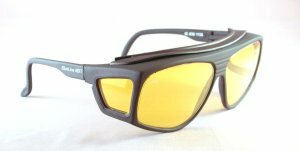 Model FG3, tops in style, not for use over eyeglasses. Earpiece length is adjustable. The BlueLine filter glasses work with the BlueLine lights to provide maximum contrast for seeing fluorescent indications. The glasses block all of the blue light that is reflected from the inspection surface and transmit only the fluorescence from the indication. You cannot use just any yellow glasses (shooting glasses, blueblocks, etc.) with the BlueLine lights. The BlueLine filter glasses are specially designed to work together with the BlueLine lights for maximum rejection of reflected light to give you maximum viewing contrast. Use only filter glasses marked with the BlueLine NDT name. 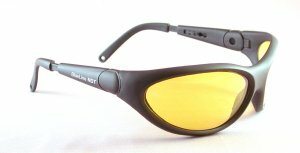 Safety glasses: All of the filter glasses conform to ANSI Z87.1 impact standards for safety glasses.